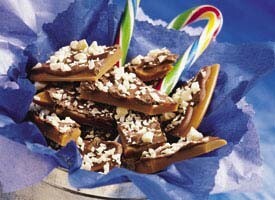 My sister Cathy makes this Christmas Toffee every year and it is always a hit. Here is the recipe. Enjoy! Heat sugar, butter and water to boiling in a heavy 2-quart saucepan while stirring constantly. Reduce heat to medium. Cook, stirring constantly, to 300°F or until small amount of mixture dropped into cup of cold water separates into hard, brittle threads. Immediately pour toffee onto ungreased large cookie sheet and quickly spread mixture to 1/4-inch thickness. Sprinkle with chocolate chips; let stand until chips are completely softened. Use a spatula to spread softened chocolate evenly over toffee mixture. Sprinkle with nuts. Let stand at room temperature until firm. Then break into bite-size pieces and store pieces in an airtight container. Thanks for the yummy toffee recipe. I love toffee all year round, but somehow everything tastes even better at Christmas.